Use the keyless access remote to start and stop the engine, to lock and unlock the doors and to open the trunk. 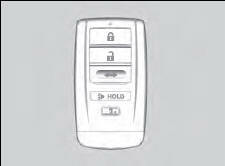 The built-in key can be used to lock/unlock the doors when the keyless access remote battery becomes weak and the power door lock/ unlock operation is disabled. To remove the built-in key, pull it out while sliding the release knob. 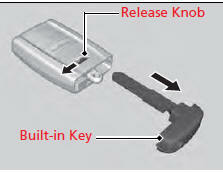 To reinstall the builtin key, push the built-in key into the keyless access remote until it clicks.